PM's son tours Netiv Ha'avot neighborhood Alon Shvut, Deer Land Park, Herodion National Park, and winery in Gush Etzion. Yair Netanyahu, the son of Prime Minister Binyamin Netanyahu, toured Gush Etzion along with leaders of the Yesha Council Thursday. At the beginning of the tour, Netanyahu arrived at the Nativ Ha'avot neighborhood in the village of Elazar, where he saw the houses of the neighborhood that were demolished a few weeks ago following the decision of the Supreme Court. Afterward, he continued with the head of the Gush Etzion Regional Council, Shlomo Ne'eman, to the new neighborhood that was established with temporary homes in which the evacuated families now live. Ne'eman presented the strategic connection that the future neighborhood between Jerusalem and Kfar Etzion will create through the Gilo neighborhood, Har Gilo, Neve Daniel, Elazar and Nativ HaAvot, Alon Shvut and Kfar Etzion. After touring Netiv Ha'avot, Netanyahu continued along the ancient path where the pilgrims visited the Second Temple for a short visit to an ancient archaeological mikveh from the Second Temple period and later to the lone oak tree at the entrance to Alon Shvut. Moshe Bruce, director of the Gush Etzion Tourism Association, told Netanyahu that this tree, which was planted hundreds of years ago, was large and central in Gush Etzion. The tree that the children of Kfar Etzion watched for 19 years from the establishment of the state to the Six-Day War represented for them the expectation and longing and the realization of the return to the land of their birth. Netanyahu also visited the Deer Land Park and, together with Yesha Council Director Shilo Adler, met with the developers and heard a review of tourism development in Judea and Samaria. 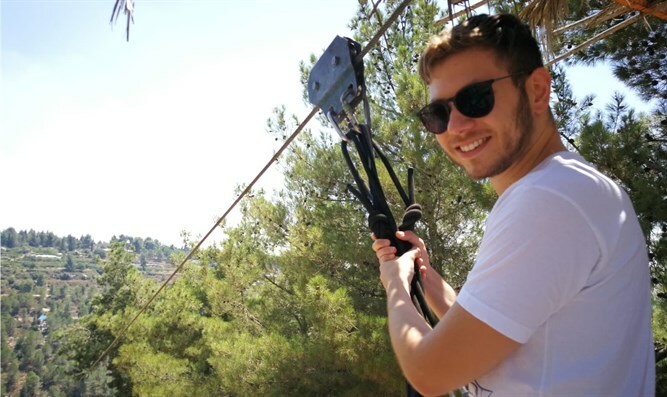 Adler and Netanyahu finished their visit by riding the longest zip line in the country, which stretches for about 400 meters (1300 feet). Yesha (Judea and Samaria) Council Chairman Hananel Dorani met with Yair Netanyahu at the Gush Etzion winery for a long conversation. The two discussed the current status of Jewish life in Judea, Samaria, and the Jordan Valley and their vision for the future. Netanyahu was impressed by the progress and size of the community, and showed great knowledge of the subject. Netanyahu visited the Herodion National Park, where he toured the antiquities that were found there, including the ancient synagogue, Herod's tomb, the newly discovered vaults, the Roman period frescoes and other new finds. Yigal Dimoni, the Yesha Council's deputy director, gave Netanyahu the book "From the Sea - A Guide for a Tourist in the Judean Springs and the Jordan Valley" and invited him to continue traveling and enjoying the area together with the whole family.